The Radian fly rod is a Scott signature piece and about as “all dressed” as an ultra-fast fly rod can get. Jim Bartschi, Scott Fly Rod president and rod designer, incorporated every bit of design technology and materials at his disposal to produce a premium fly rod that most will find hard to resist. 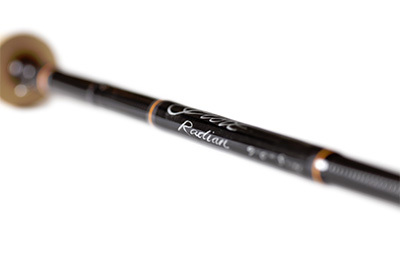 In a recent article Bartschi stated, “My preference is for rods that are progressive, meaning they bend according to how much line is out of the rod tip and the amount of acceleration and power put in to the rod by the caster.” That thinking is the foundation for the Radian’s finer points: the rod’s fly-launching capability is amped, but without sacrificing any aspect of line control. One revealing test for any (premium) fast rod is how well it performs at short range, and the Radian can lay claim to being one of the better rods in that category. Fifteen-foot casts can be accomplished without any significant softening of your casting stroke. Using roll casts as a mid-range parameter, as they can sometimes make up a large portion of your fishing day, the Radian excels here as well. The blank formula results in extremely quick tip recovery speed. Add that progressive bend that Bartschi refers to, and the package enables casters to get that ultra-crisp snap and stop at the end of a roll cast to get your flies sailing at good clip. As you’d expect, long range casts – without line collapse – are achieved without strain, as are two other needs met with a fast-action implement: line mending and tracking. The Radian sports a sensitive but not entirely supple tip, so tippet protection will require a little extra attention from the fisher when dipping below .006 territory. As for fish-fighting characteristics, the Radian rates high with regards to strike detection, and I enjoyed muscling in the fish that made the boldest escape attempts and put a strain on the 5-weight model I tested. 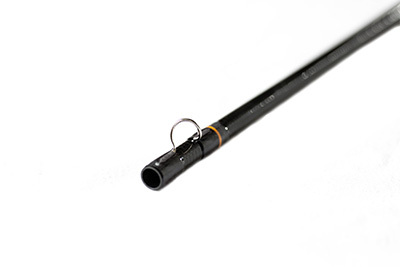 This a ready-for-any-scenario fly rod. There is no mention in Scott promo literature that the Radian is a workhorse rod, but it can easily fit into that category – if you own several rods, chances are that this is the rod that would get to see the most light of day. The Radian is hand-crafted. Fit, finish and hardware (see Scott website for specs) are all five-star. Titanium framed SiC stripping guides, reel seats with burled box elder spacers, top grade Portuguese cork, and newly patented Universal snake guides from American maker Snake Brand round out the Radian.